Porsche will campaign a new 911 GT2 RS at Pikes Peak at the end of this month in a Porsche 911 GT2 RS under command of seven-time champ Jeff Zwart. And to prove their cars are as awesomely reliable as they are reliably awesome, he'll do it in a car he drove 1,100 miles from Porsche Motorsports HQ. Zwart previously set the record in the 2WD Time Attack last year in a modded 911 GT3 Cup car and now he'll try the same in a street legal version of Porsche's 620-hp super-911. The trip started this weekend when the crew picked up the car from HQ with his crew for the two-day trip for the 89th running of the Pikes Peak. 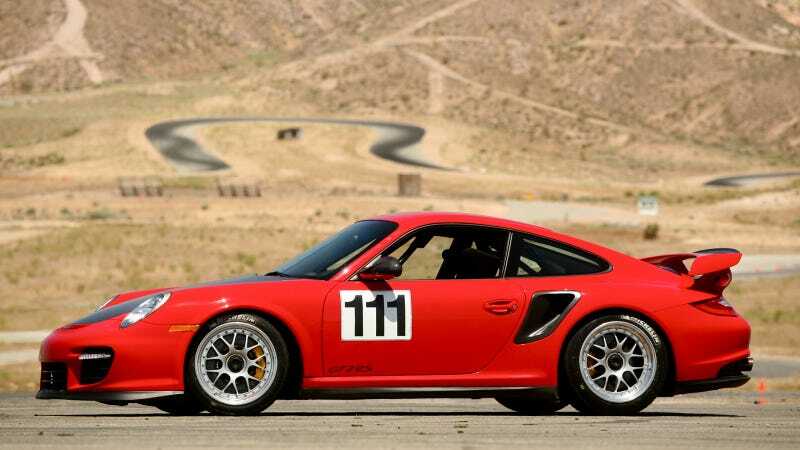 "We wanted to show the sports car enthusiasts that the Porsche 911 continues to be a car that meets multiple transportation needs, something its owners have known for years. You do not have to hit the top speed of 205 miles-per-hour to enjoy this car on the road, yet we hope to use the 600-plus horsepower to get us up Pikes Peak fast enough to win the class and break our own record," said Zwart. Here's hoping the car is in good enough shape to be driven back.